Why do we love yarn so much? I was in work yesterday, putting labels on some lovely, squooshy new aran-weight Craftspun Yarn, spun in Kildare. It smelt so sheepy, felt so soft and just shimmered with the new-wool shine that makes me wanna make stuff, and I thought... what IS it about yarn that makes me go all giddy, and more importantly, why doesn't it happen to more people? The smell of yarn, to me, is something I can't get enough of, but I'm not all that sure why... all I know is that I want to stick my nose into the middle of the biggest, squooshiest skein of yarn I can find and leave it there. 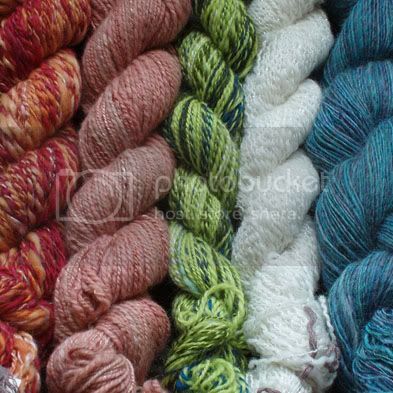 Is it the promise of a million unique projects that makes us yarn-happy? Is it simply that we're all slightly cracked in the head? Free Crochet Pattern - Free Bee! This cute little bee won't sting you, and will never get stuck bopping himself off a closed window! The pattern came about after I was stuck on a delayed flight with two, non-crafting friends. I managed to get a crochet hook on board, but they were getting bored, so, they demanded a prize from me for the person who won a game of “Dots”. I proposed, off hand, to make a bee for the winner. 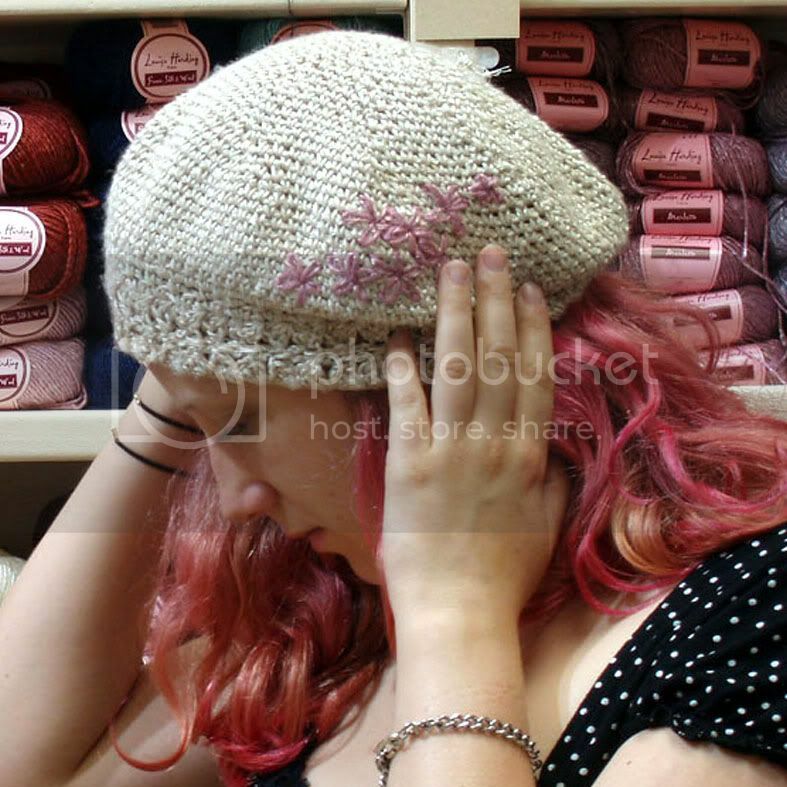 If you make this, or any of my other projects, please link me if you're on ravelry.com or send me a photo! I'd love to see your finished projects. This bee can be used as an air-freshener in your car by adding a few drops of your favourite essential oil, is can be used to keep mosquitos away from barbecues by infusing a few bees with lot of citronella, and hanging up around the party area, and they also look great on a child’s mobile! I know this seems like a strange way to check guage, but it’s difficult to get a bee to sit still long enough to be measured! 4. ch1, dc 16, ss to close. 6 ch1, dc 16, ss to close. 8, ch1, dc 16, ss to close. 10. ch1, dc 16, ss to close. 14. ch1, dc 16, ss to close. Note: Stuff body full of yarn scraps or your choice of filling. I’d suggest using black, as this won’t show as much through the stitches. 17. Cast off, leaving a long tail of yarn. Thread needle, sew a running stitch through one loop of each of the remaining 8 sts, pull tight, secure with a few discrete sts and hide tail inside bee’s body. To make your bee look nice and crazy, fix two big beads with an embroidery french knot to its face. Pull the last black yarn scrap through to the back of the bee to be used a its sting. The legs are just yarn, sewn from one side of the body to the other and secured, knotting upon itself. Knotting at different angles will give your bee’s legs more life. Sew wings to back using yarn tails on wing as shown below. 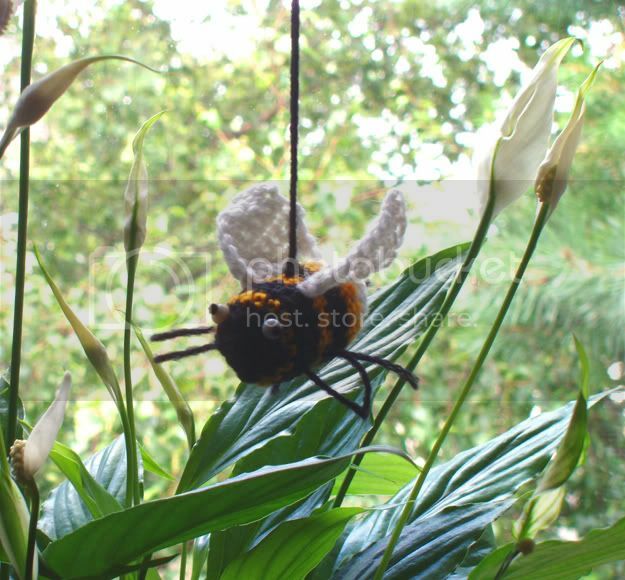 Add a scrap of yarn to the centre of the bee’s back to hang your lovely new bee up and show him off to the world! Thanks for linking me on Stumble Upon! Enjoy the earrings, guys and I hope to see you back again. So, with the Tour de Fleece coming to a close, and me having gotten completely side-tracked, I decided first to try and dye my own roving colours with my paint palette of hair dyes, to spin something unique to me. This I half-accomplished: my roving, though beautifully colours, was slighted felted when it came time to spin it, and it spun up far rougher then the blue-faced leicester I had used deserved. So, I have taken a step back, found some sheep-coloured aran-weight yarn, and decided to have a bit of food-colouring fun! I present, below, a guide to dyeing animal-based fibres, with food-colouring in your home. All your materials should be for dye-use only. Don't use any of them to prepare food. True, you're dying with edible food dyes, but it's better to be safe. So! In dying, the first thing you have to do is prepare the yarn to accept colur. If you skip this step you'll either get no result, or a very faint one. Either way, this step is a good idea. Take you yarn and tie it into loose skeins. These should be left to steep overnight in a solution of 25% vinegar 70% water. A lot of people suggest bringing this mixture to the boil slowly, but in my experience the only difference boiling makes is to leave you with a skinky home, and angry co-habitants. Boiling also makes it more likely that you'll felt your yarn, making it rougher. 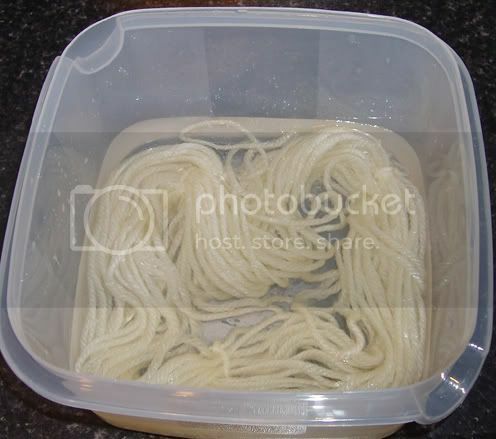 Once your yarn has had a good few hour in your mordant mixture, remove and rinse gently in cold water. The trick in every step of this process is to be gentle with the yarn. Felting is accomplished with movement + heat + soap, but any two of those elements can just as easily mess with your wool. 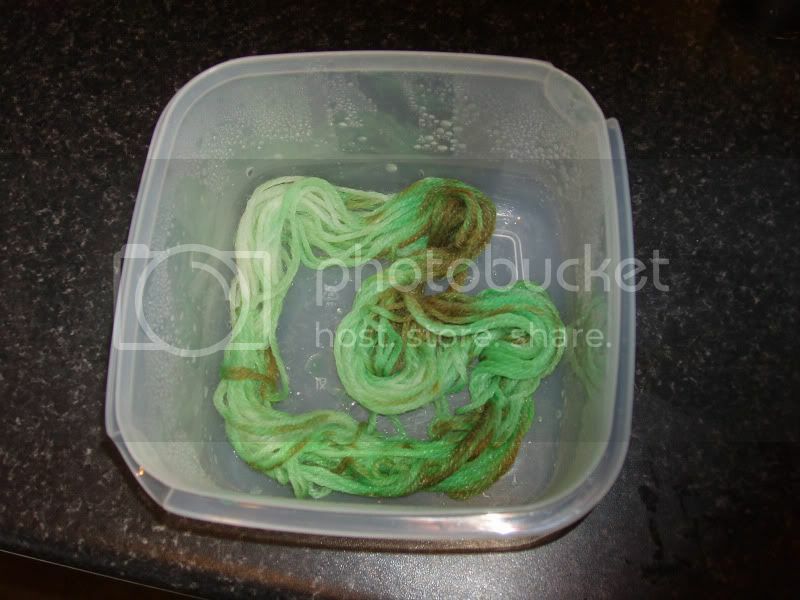 Place the still very wet yarn in a plastic container and add colours as you wish. I used an eyedropper to get the colour all through the yarn, but equally good would be a potato masher pressed onto the yarn gently. This will help squeeze the colour thought to the bottom of the skein. Try stripes, splashes, solid colours. Basically, experiment to see what you come out with. Into the mircowave, on a medium heat for two minutes. Remove and ensure the yarn is still nice and wet. Turn the tub gently to the side, if the water appear clear, you're done. If it's still got colour in it, let the yarn rest of a few minutes and give it another go in the microwave for two minutes on medium. Repeat this process until the water appears clear. This means all the food colouring has soaked into the yarn and it's a wonderful sight! Remember, it's important not to touch the yarn or move it in the tub at all until it's cooled completely. Just leave it aside to cool down in its own time. Once it has, give the skein a rinse in cold water again, squeeze gently in a towel, and leave to dry out of direct sunlight! 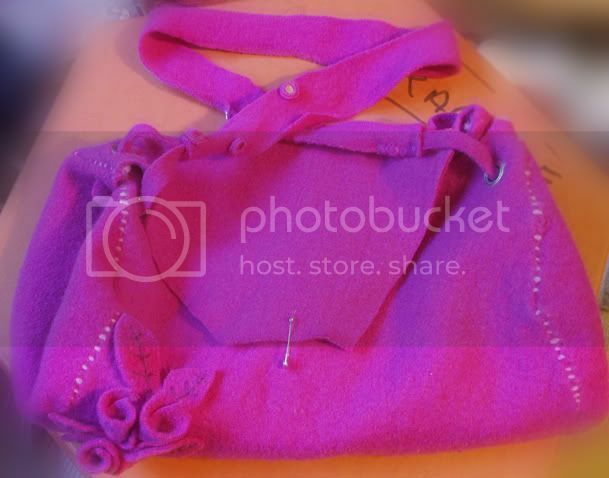 So, it's been a while, and I've finally got around to the noisy bit of making this lovely pink bag. It's time to do some hammering! After I settled on the shape of this bag, I realised the best way to get a good shape, without losing a nice open mouth (for finding all those fiddly things that end up hiding at the bottom of deep bags...) would be to make it expandable. The easiest way to do that in this case was to hammer in eight eyelets - four to a side - thread some strap through them and let the weight of the bag close the gap. You can see the middle two eyelets on the right side of the bag, there. Next, I'll be adding a mobile phone pocket, deciding what to do with the fastener (as I think we can all agree a safety pin just won't cut it...) and yes... the lining. Self-patterning yarns, and why they are the devil's work. It is my honest belief that self-patterning yarns hate crochet! A strong statement, perhaps, but nonetheless totally true. What other explanation can there be for some of the finished garments out there that look like they've been through an epic battle with a bucket of paint... and lost? It's a truth yet to permiate many crocheters sensibilities that the vast majority of self-patterning yarns were designed for knitting, and the longer stitches that crochet often produces are just not pretty when worked up on anything but the more gradual of colour changes. It makes me cry inside to see so many lovely patterns, originally designed to be made in solid colours, totally ruined with patches of colour. It jangles the senses. Crochet at its core creates a far more textured fabric than knitting. Highly textured patterns often don't lend themselves well to abrupt colour changes. At the most fundamental level, this is what bother me. That said, I'm trying to get over my distaste for self-patterning yarns by trying to break up the colours in Wendy Happy (Colourway:Virgo) with crochet moss stitch in a simple wrap-around vest top. New Pattern Download - Spring Picnic Hat! Firstly, let me heartily thank everyone here, and on ravelry who sent me good wishes after the passing of my gorgeous, grumpy little dog, Sam. I'll miss him terribly, but all your warm thoughts helped a lot. The download is available here for a bargain price. 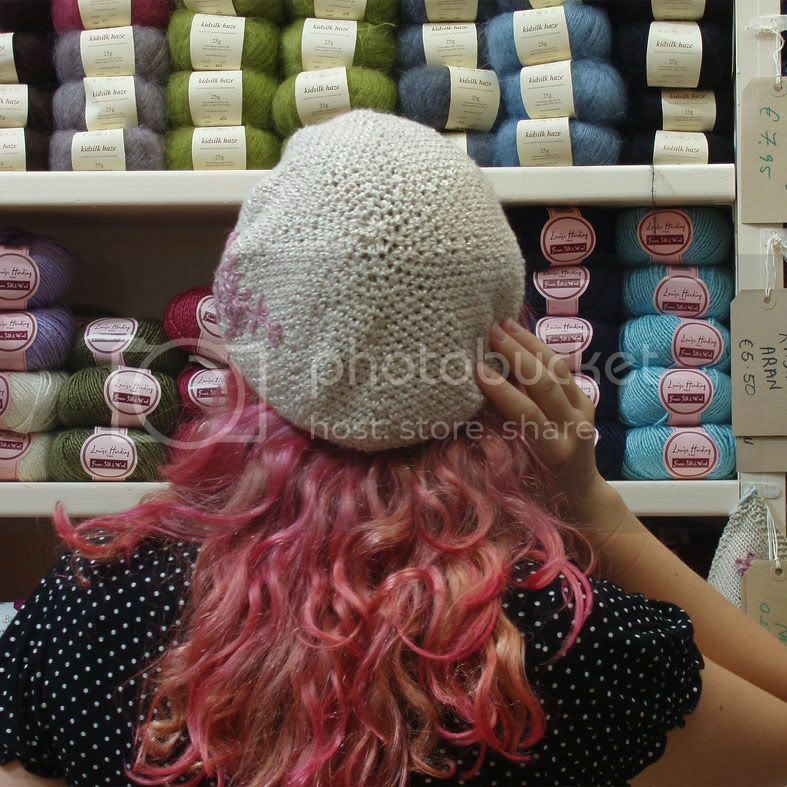 I've also made it available free, with purchase of the yarn at This Is Knit's shop in the Powerscourt Centre, Dublin. Life has a habbit of putting its foot out and tripping you up when you least expect it. My Mam called the day before yesterday to tell me that my dog, Sam, (a very old, super-grouchy Lhasa Apso) had gone for an x-ray to see why he wasn't eating, drinking or acting like himself at all. It turned out he had a blockage in his gut. The vet also discovered that he was severely arthritic all down his spine. Though it broke our hearts, operating on a 14 and a half year old dog wouldn't have been fair, and we agreed it was time to let him rest. He was the type of dog whose love you had to earn, which made losing him that much harder. This is footage of Sam and me at our best. I won't be the same without him. He's now at rest under a Chestnut tree I grew from seed, at the edge of the garden, his collar hanging, unworn, on the branch over his grave. Day 4 flew by for me in a whirl of roving. I spent the best part of the day in front of my spinning wheel, making up this batch as my entries for the day. 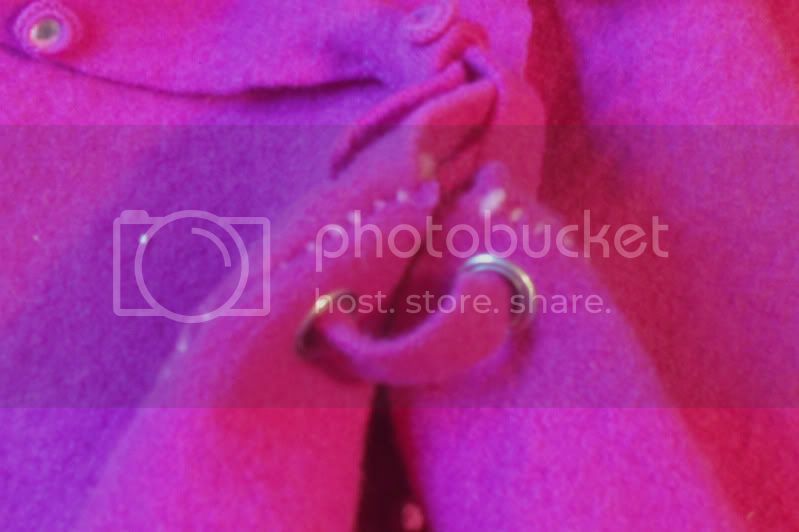 I uploaded the images thismorning, and was lucky enough to get the second entry post. Well, thanks to a well-meaning friend, I am now all revved up, and ready to begin spinning for Team Ireland in Ravelry's Tour de Fleece! It's an event that will last the span of the Tour de France cycling championship, and will involve a lot of spinning, carding (don't forget to warm up first, Aoibhe...seriously. Remember what happened last time...) and skeining. ...It just hit me that today is the Fourth of July. Happy day, Americans! Have a great one, lads and lassies! I woke up this morning, the warm breeze coming through my open bedroom window, and I thought "Ohh, Harry Potter is out soon, I wonder what I should wear to the screening" Now, I'm no big dresser-up for events; I have never gone to a Star Trek film dressed as a Vulcan, nor have I seen Star Wars dressed as Princess Leia... but... I would not draw the line at Luna Lovegood's awesome earring choices. Please, let me know what you think, and enjoy! With the new Harry Potter film out so soon, I thought it’d be a great chance to wear some distinctive earrings! 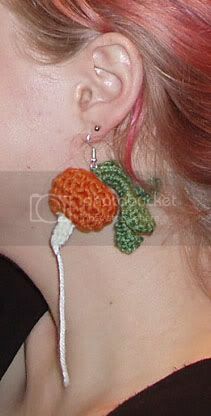 These radish earrings are directly inspired by Luna Lovegood’s spectacular fashion sense. Wear them to your local cinema, and turn some heads. Your choice of earing fitting. 1. Using white yarn, ch 3, ss into first ch to close. 7. ch1, dc into every dc on round, ss into 1st dc to close. 10. At this point, stuff your radish with waste yarn for filling. I’d recommend using the same colour yarn as your radish, to avoid the filling being seen through the stitches. 11. ch1, [2dc] around, ss to 1st [2dc] to close. (3 sts) Cast off Red, and weave in end. 12. Cast on Green into one of the top 3 sts on radish. ch 9, dc into 2nd ch from hook. Note: every leaf stitch hereafter is stitched around the chain, not into it. 13. dc1, tr 2, dtr3, tr2, dc 7, ss into top of radish. Repeat leaf pattern twice more, into the sts left at the top of the radish. 14. Cast off Green and use this yarn to set your earring fitting into top of radish. Note: I found wrapping the yarn tail once or twice around the base of all three leaves settle them nicely on top of the radish.